Nuovo challenge a Crafts 4 Eternity questa settimana ed il tema scelto è "Stencils and Masks". New challenge at Crafts 4 Eternity today and our recipe is "Stencils and Masks.". Per la realizzazione di questa card rosso fuoco ho utilizzato carte Crelando ed uno splendido stencil di Doobadoo, che ho embossato a caldo con polvere trasparente. Ho poi utilizzato un punch di Heyda per i bordi bianchi ed un bel fiocco in raso rosso. 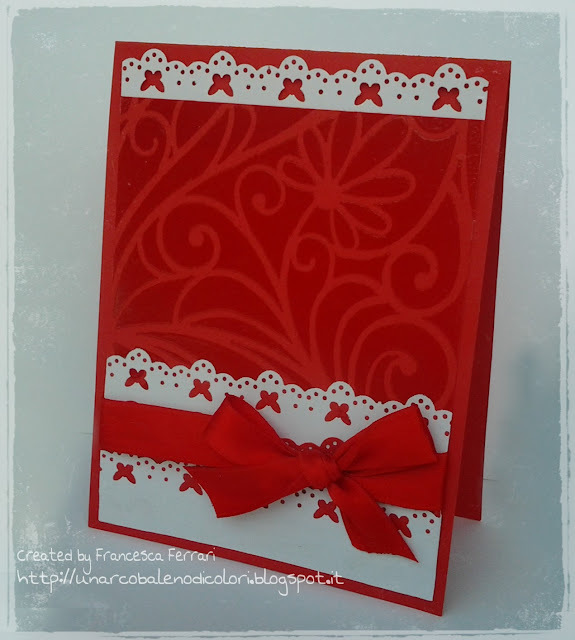 To create this red card I used papers from Crelando and a beautiful stencil from Dutch Doobadoo, which was heat embossed with clear powder. I used a punch from Heyda for white borders and a gorgeous satin lace for the bow. What a lovely card! Thank you for joining our “Lots of Red” Linky Party this week at Pause Dream Enjoy. Wow stunning card I love this whole look. Thanks for joining us at Inspiration Destination. Stunning embossing and I love the contrast with the white. Bravissimaaa tesorino, stai creando delle meraviglie !!! Lovely card! Thanks for sharing your creation with us at Craft Your Passion. Beautiful. Thanks for linking up at PDE Linky Party. Fabulous card! Thanks so much for joining us in the PDE Linky Party "Lots of Red" challenge!